“It’s like an electric nanoforest,” says the researcher. One of the inevitabilities of life – along with humor and paradox – is change. Seasons change, people will be born and die, and grass – like other foliage on Earth – will continue to grow. As a result, it will need to be clipped. But what if the clippings could be used for more than just fertilizer or compost? According to MIT researcher Andreas Mershin, they can. In fact, the scientist believes that within a few years, all one will need to do to start producing immediate electricity is stir some grass clippings into a bag of cheap chemicals and paint them onto a roof. Granted, the process is a bit more complicated than he makes it sound, but it’s easy enough to comprehend. Think back to your high school biology days when you learned about photosynthesis, the process in which plants turn sunlight into energy. 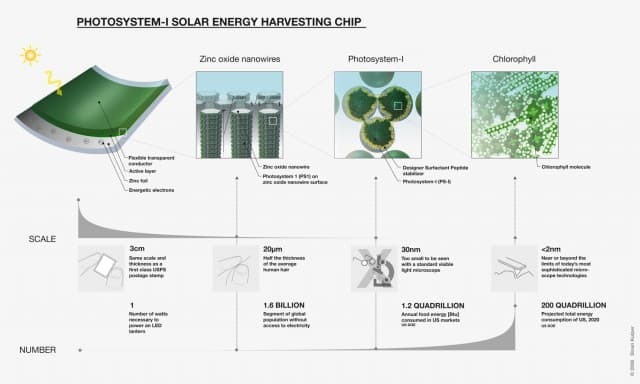 The MIT researcher developed a process which extracts the photosynthesizing molecules, called photosystem I, from plant matter. Because photosystem I contains chlorophyll, the protein that converts photons into a flow of electrons, the molecules can be stabilized and spread on a glass substrate that is covered in a forest of zinc oxide nanowire and titanium dioxide “sponges.” ExtremeTech relays that when the sun shines on the mixture, both the titanium dioxide and the new material absorb light and turn it into electricity. The nanowires then carry the electricity away. 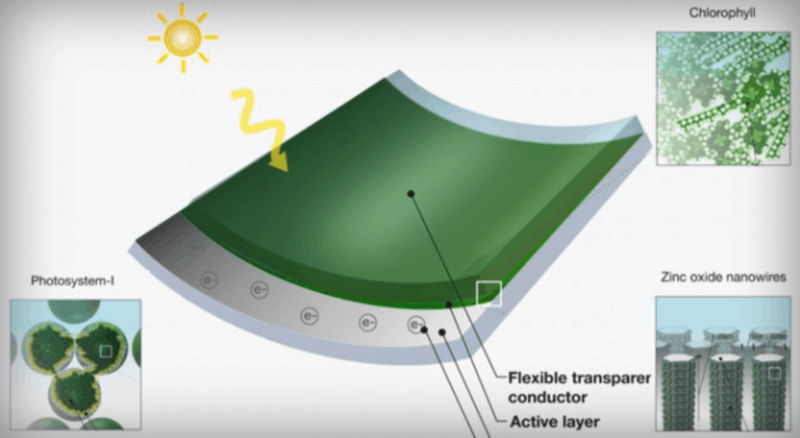 Essentially, the layer of silicon in conventional photovoltaic cells has been replaced with a slurry of photosynthesizing molecules. “It’s like an electric nanoforest,” says Mershin. He told MIT News that the new system’s efficiency is 10,000 times greater than in the previous version he was working on. However, it still needs to improve another tenfold or so to become useful. Despite the efficiency-boosting nanoforest, Mershin’s solar panel only has an efficiency of 0.1%. An efficiency of 1 or 2 percent is required to light anything from a single LED light to a house with the cheap panels. The researcher is optimistic that progress toward improving the panels’ efficiency will be rapid, though, as he and his colleagues have now lowered the barrier to entry for further work. His ultimate goal is for consumers to be able to purchase a cheap plastic bag that comes pre-filled with the necessary chemicals and “one sheet of cartoon instructions, with no words.” Agriculture waste may then be added to the bag, stirred it around, and then painted onto a sheet of glass. The ability to generate energy in such an economical way could revolutionize power generation in low-density areas that are off grid or in developing nations. It could also keep people safer – and healthier, as kerosene lamps are the most widely used source of lighting in poverty-stricken, rural locations. What are your thoughts? Please comment your thoughts below and share this news!